This handsome apartment building at 677 West End Avenue was erected in 1926 and converted to a cooperative in 1982. The buff-colored-brick, 16-story building, which has a shallow interior court that opens to the south, has 61 apartments. 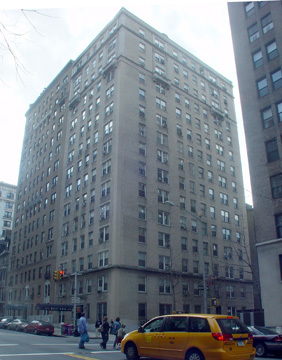 It is also known as 300-304 West 93rd Street. It was designed by Leo F. Kunst for the Dominion Realty Corporation. The building, which has three stringcourses and a few decorative balconies to enliven its facades, has a step-up lobby and consistent and original fenestration. It permits protruding air-conditioners and has no doorman, no concierge, no landscaping, no garage and no sundeck. The lanterns flanking the entrance are not original. The building was built on the site of four brick-faced rowhouses of five stories each.